inches, then the Yamalink and stock adjustment for ride height won't be enough. If you're still heavier, then you may need to beef up the the suspension on the XT250 or just plan on upgrading immediately the Honda CRF250L. I've only seen offerings by a custom company, but they have a calculator based on your riding habits, weight, and more to get you the right suspension. It should have very similar range, but my friend and I both see a steady 53-55 miles per gallon, which is far less than either company reports by 19 to 17 miles per gallon. And I am referring to super gentle driving for an entire gas tank and trying to peel the tires off onto the payment. So if you don't care about gas mileage, other than the all important range issues these small bikes have stock, know this. Having as much fun as you can handle appears to have NO EFFECT on range! 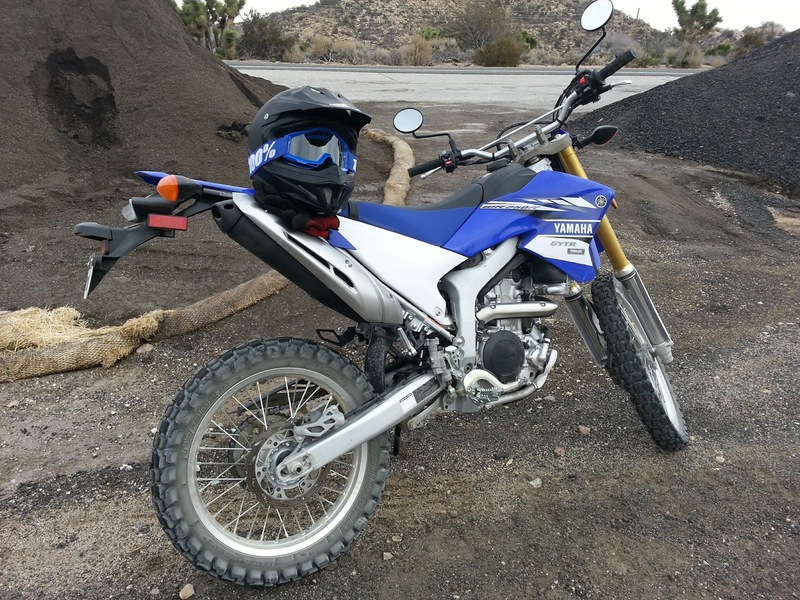 Yamaha's WR250R reported miles per gallon? 71. Real world? 53-55*; well, I did get 74 once when I went up a high elevation mountain and coasted more going down it (and I had to beat on the throttle hard with all the traffic on the way up). 1.9 gallons CA model tank capacity and 2.1 gallons for everyone else means 102.9 to 113.4 miles of range in my experience. The truth may be that the Honda has more HP than I've been able to find hunting around online. It's barely slower than the Yamaha's 24.5 HP, but since Honda has a throttle stop built tighter in to protect it's engine for longevity and it has a very narrow range of RPM, which has full power, it will in effect be much slower if you go outside the computer's desired RPM range. Honda has 1 less torque, but it's torque comes in sooner than Yamaha's 8,400 RPM torque of 17 (2008-2014 figure - hard to find the torque for 2015 to 2017 - this engine has been beefed up, but by how much really? An exciting review online is hardly numbers, especially if they were supported by Yamaha to do the review). 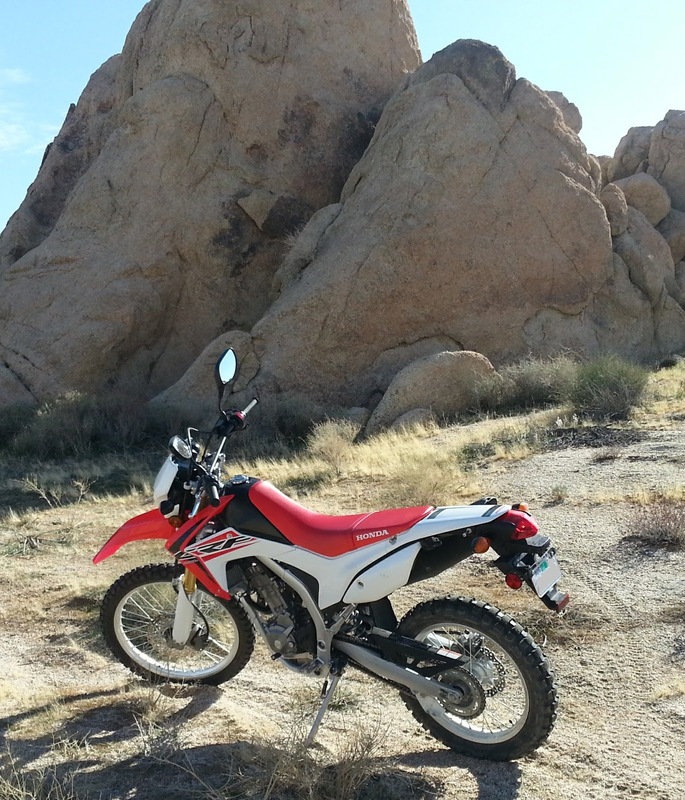 Honda CRF250L's 71 miles per gallon. Real world? Same as the Yamaha with another approximately 200 lbs. man for 53ish miles per gallon. While I didn't intend to review a motorcycle I hadn't rode, it's an honorable mention as it's a lot like it's big brother. In comparison to the WR250R, this dream machine loses the 6th gear, adjustable suspension, ride height, and more. Ride height isn't a great loss part for some, and if you're lighter, this with a lower combustion engine, may not be a loss either. Power loss may not matter if you're smaller, you may still keep up just as well! Every motorcycle has a niche that it fills and this motorcycle should not be forgotten for it's being more affordable not just to buy, but the fact that it wants regular fuel. No premium fuel gouging or driving in an area where higher octane isn't available. Still, if the Honda fits you, you may not want to consider Yamaha's XT250, reliable HP figures are hard to come by, but this is seriously behind in the stats on paper for HP in comparison to the Honda CRF250L. Yet, while it does have lesser than the Honda CRF250L, some of the parts you may want on your XT250 could easily be obtained from the WR250R highly compatible parts list, while some aftermarket for similar upgrades on the Honda are very harder to find. I've heard reported as high as 22.8 HP on the CRF250L, but let's be honest, my buddy and I even swapping bikes always find the Yamaha faster, so if the CRF250L did have nearly the same HP, then it's not utilized as well. I did better confirm it's torque at 16.2 TQ. The torque figure makes sense. This was confirmed repeatedly by multiple sources. I find it silly that Honda and Yamaha official websites don't include this information. Honda having less torque than HP does make sense though, since these are meant to be higher revving engines. Yamaha only outclasses with 17 torque, but it comes on to late in the RPM to use the torque down low when your meeting difficult terrain. To have the higher rev range help you out of tough terrain can have your back end bouncing and juking underneath you, putting you out of control. It may not be just skill that gets my friend uses to outclass me up rough hills and terrain. It's tires stock aren't as good for desert (mostly what I have available to ride on).